Survey reveals a supply chain talent shortage that could become a critical problem for companies in the near future. What is your company doing about it? When it set out to explore the digitalization and status of the global supply chain last year, DHL turned up some expected and unexpected results. Initially highlighted in the Council of Supply Chain Professionals’ (CSCMP) 2014 survey, the gap continues to widen between the available number of supply chain professionals and the number of empty positions in the field. At the time, nearly half of the participants in CSCMP’s Third-Party Logistics Study said they were having trouble finding and retaining qualified employees. Fast-forward to 2018 and the landscape hasn’t gotten any easier. In its recent report on The Supply Chain Talent Shortage: From Gap to Crisis, DHL found that the supply chain talent pool is not keeping up with the changing requirements as technology reshapes the industry. A key problem is that more than one-third of companies have failed to take steps to create their future talent pipeline or develop their workforce, DHL reports. This doesn’t bode well for a job sector that’s projected to grow by 26% over the new few years, according to the Bureau of Labor Statistics. One global study estimates that demand for supply chain professionals exceeds supply by a ratio of 6:1, with some predicting that ratio could be as drastic as 9:1. Changing skill requirements: Today, the ideal employee has both tactical/operational expertise and professional competencies such as analytical skills. 58 percent of companies say this combination is hard to find. What to do about it: To offset this challenge and get their employees up to speed, employers should explore cross-training, mentoring programs, coaching, and online training. Aging workforce: As much as a third of the current workforce is at or beyond the retirement age. That means it’s time for the millennials and Gen Z to shine. What to do about it: Pair veteran workers with the younger, digital generations to help create your next and newest supply chain star. Lack of development: One third of companies that DHL surveyed have taken no steps to create or feed their future talent pipeline. What to do about it: Take the time to identify future supply chain workers, managers, and leaders now. Then, train and cultivate them in a way that helps them work through the challenges of the modern-day supply chain. Perception that supply chain jobs lack excitement: The industry is still contending with the impression that other fields are more prestigious and offer more opportunities, fueling lack of interest in the industry within the world’s future workforce. What to do about it: Help new recruits see that there really is glamour in running the world’s supply chains. It’s not just a warehouse or distribution center job anymore. What they’re doing contributes to overall organizational success and performance—pretty powerful stuff. 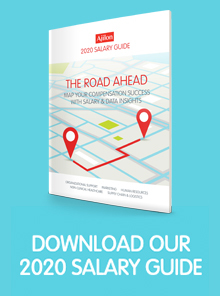 Check out our 2018 Salary Guide to make sure your business is in a position to find and retain top supply chain talent.